Today, December 1st, marks the 2nd year since I hit publish on post #1 on this site. 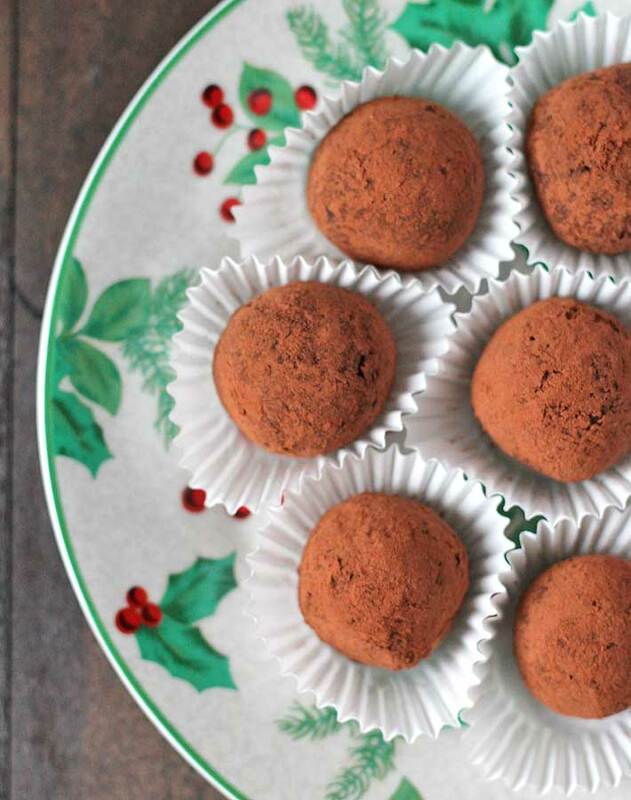 So what better way to celebrate a 2-year anniversary than with chocolate truffles? 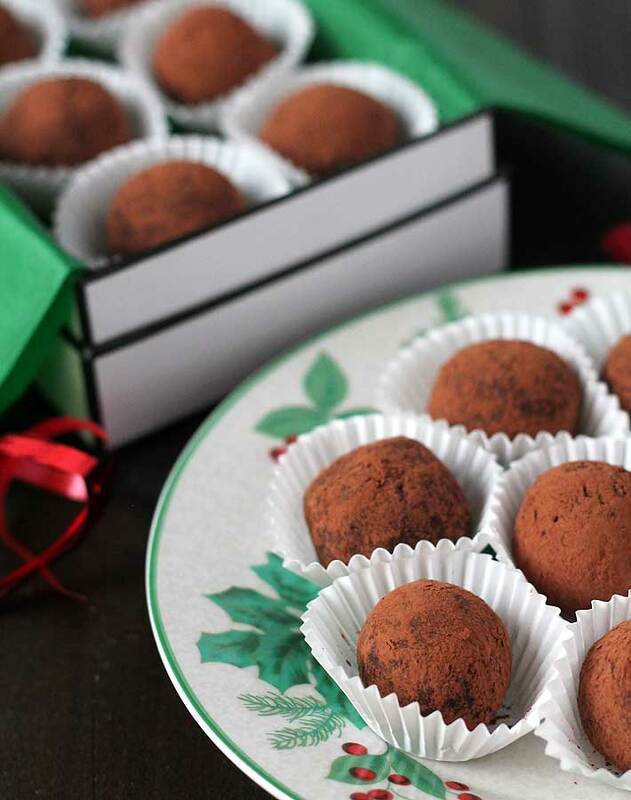 And not just any plain chocolate truffles: Dark Chocolate Mint Truffles! I’ve mentioned before (in my dark chocolate mint avocado pudding recipe and online, everywhere!) that chocolate + mint is one of my favourite flavour combos. 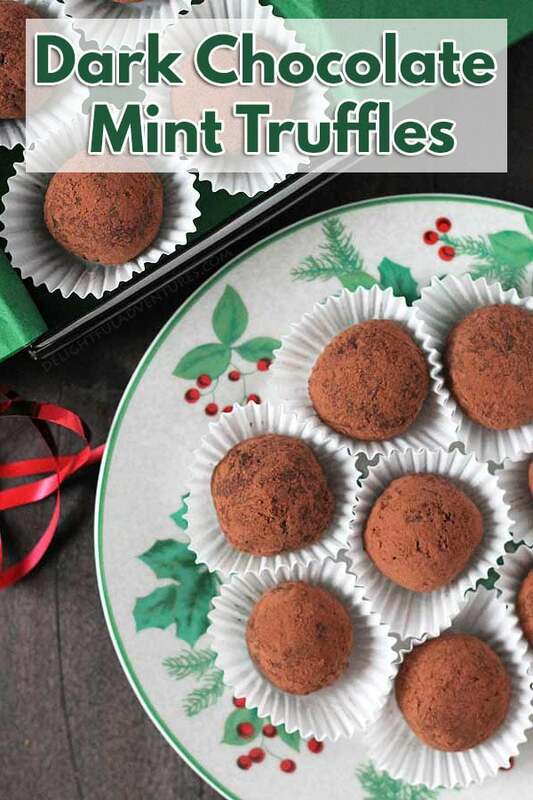 Dark chocolate mint truffles are very easy to make, easier than you may think. All it takes is 4 simple ingredients, and a little bit of patience while things chill in the fridge. The result is melt-in-your-mouth, chocolaty mint decadence. They’re perfect for when you have guests over or for giving as gifts. Who wouldn’t be happy to open up a box and see these waiting to be devoured? I mentioned at the top that this is the 2nd anniversary for this website. It definitely doesn’t feel like 2 years. It doesn’t seem that long ago that I wrote the 1st anniversary post. Time really does fly when you’re having fun. I’ve had such a great time sharing recipes, working on my photography, and most of all, receiving messages from all of you. 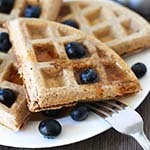 The mom who wrote in to say that her son has food allergies and has not had a waffle in years but now he can again, thanks to my vegan gluten free waffle recipe. Or the bed and breakfast owner who messaged to say that she made my apple raisin cinnamon rolls for vegan guests and that they were eaten in record time. Or the reader who was newly diagnosed with celiac disease who had been trying to find a gluten-free pancake recipe that actually tasted good and she did, thanks to my recipe! These messages make me so happy. When I started this website, I never imagined that it would have that sort of impact. It was mostly an outlet for me, something that I had wanted to do for a long time. This website is not huge, I don’t post as often as I’d like, and I don’t work on it full time, but to see that what I’m sharing has made a difference for at least one person and that I have such a nice group of engaged readers who take in and enjoy what I put out? Wow. Thank you to all of you who send me lovely messages, those who share my content online, and those who always come back to see what’s new. Thank you. So shall we talk a little more about these dark chocolate mint truffles before you get to the recipe? I use vegan dark/semi-sweet chocolate chips. Most high quality dark chocolate chips are vegan but check the ingredients to be sure. 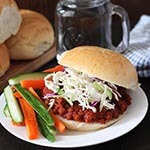 Here in Canada, try President’s Choice (my favourite and what I used in this recipe), Enjoy Life, or Kirkland Signature. Pin this recipe on Pinterest for later! 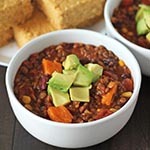 If you like this recipe, you may also like these! If you make these, share a pic on Instagram and use the tag #delightfuladventures. And tag me: @delightfuladventures! I’d love to see! 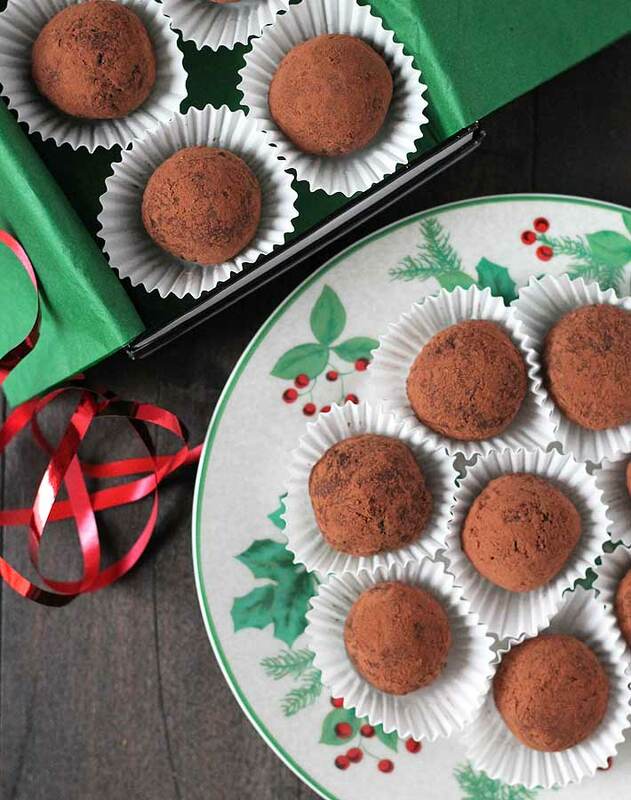 Melt in your mouth, easy to make, four-ingredient vegan Dark Chocolate Mint Truffles that are perfect for homemade holiday gift-giving or for entertaining. Heat coconut milk over low heat until it is hot to the touch but not boiling. Pour coconut milk over chocolate chips and let it sit for a few minutes so the chocolate melts. Add peppermint extract and stir well to evenly distribute. *See note below. Place the mixture in the fridge for up to 3 hours or overnight so the chocolate becomes solid. Remove the chocolate from the fridge and with a tablespoon sized scoop or a tablespoon, scoop out balls and roll them in your hands (quickly so they don't melt!) so they are round. Set aside on a plate and continue forming the rest. Once all the balls are formed, roll each one in the cocoa powder until they are coated. 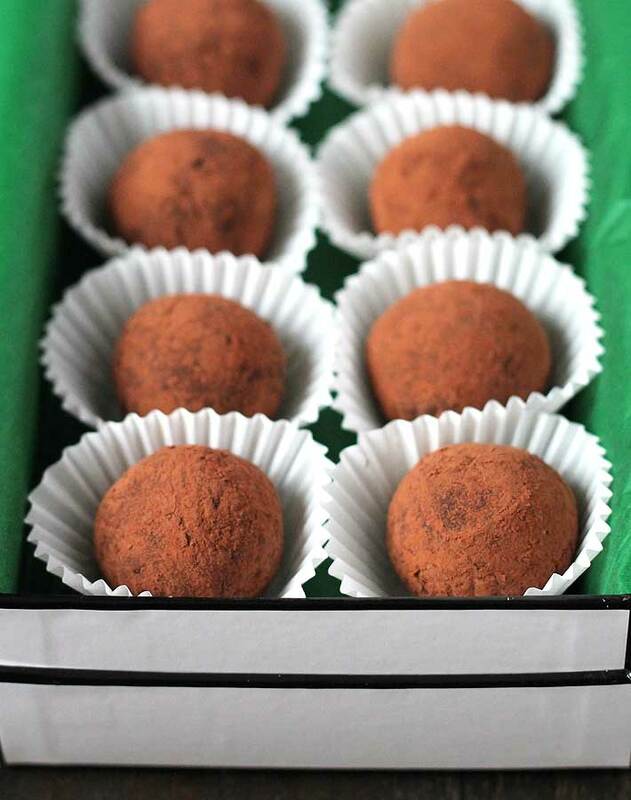 Refrigerate the truffles for a few hours or overnight to make them solid again. You must use canned coconut milk for this recipe, full fat, not light. I use Native Forest Brand. Different peppermint extract brands are stronger than others. Start out by adding 1 tsp and then taste. If you like the strength of the mint flavour, stop there. If you'd like it a bit stronger, continue adding by a 1/4 tsp at a time, mixing and tasting until you get to where you like the flavour. 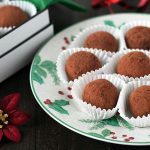 This recipe made 16 truffles for me but you may end up with slightly more or less, depending on how big or small you make yours. Store truffles in the fridge. Nutrition info is based on the recipe as it is written and on 1 truffle. Nutrition info is only to be used as a rough guide. Click to learn how nutrition info is calculated on this website. Any idea how much peppermint essential oil I could use to replace the peppermint extract? Hi Kimberly! I have not made it using peppermint oil, so I can’t give you an exact measurement, but since peppermint oil is much more concentrated, you will need a lot less than the amount of extract called for. A quick online search is saying to divide the extract by 4 and start with that amount of oil. I would start with about 1/4 tsp, taste, and see if you’re happy with the flavour. If not, add more, 1 drop at a time. I hope this helps! 🙂 Let me know how it goes.